I'm looking to get into wind foiling and Neilpryde has just released the "glide wind" with a powerbox fitting. the board I'm hoping to pair it with is a JP X-cite ride 105 that is 255 cm by 65 cm. the foil is supposedly compatible with thinner and smaller boards but I'm hoping to get a second opinion. Do you guys think this would work. Hi Fergus, what size Glide Wind were you looking to get? I've used the small wing on an 85cm wide Slalom board and it had plenty of manouverability and a decent amount of lift for a small foil. My only concern would be that with a board that's only 65cm wide, the bigger wings may be a bit harder to control, however, these are made to free ride and so with the amount of curve the wings have you could be alright with the medium and large. I'm not sure if the shop stocks the larger wings or if they would let me try them, I live in Albany WA and the closest shop is in perth so I'll make some calls and see if I will be allowed to do a "try before you buy". I weigh about 60 kilograms so maybe I would better suited to the medium wings. not looking for any high performance stuff just something to learn on. thanks heaps for the advice, it was really helpful. The large works very well in 8-10 knots. Very stable and predictable. I have the 2019 NP Glide Wind and am using it on an RRD Firestorm 111L which is 68cm wide x 236 and has a Power Box. I am 85 kg and I have the small wing. I have no problems getting it flying so if you are 60kgs I would definitely not go the medium or large. I have used it with a 4.7, 5.7 and 6.5 and works with all of them. I hope this helps. what shop did you buy yours from? I had a talk with danish NP GURU about it. is this exclusive to jp boards or does the same issue come up in other Powerbox boards. I'm in Canada and last season I used the NP RSOne Convertible Foil 6 times on a Bic Techno 148 (75 cm) and did not have much luck with long stable flight on 5.4 to 6.9 (although I did do one foiling gibe which was really a fluke!). My goal is to foil in 10 to 16 knots, but from posts on other topics it looks like the RSOne is not a good choice. I am 72 kg. I am considering the 2019 Glide Wind (Small, 1032 cm2) with the Bic Techno. What do you guys weigh? Do you think the small is enough for me? You guys down under are a season ahead of us, so any other comments would be helpful (stability, gibing, top end . . .). 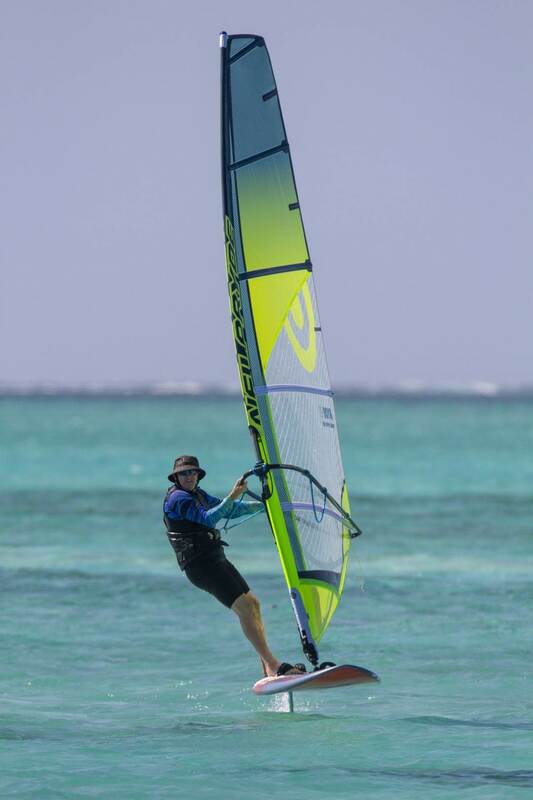 My other possible foil choice is the 2019 Slingshot Hover Glide Fwind Foil which is even bigger (1534 cm2). Any experience with these? 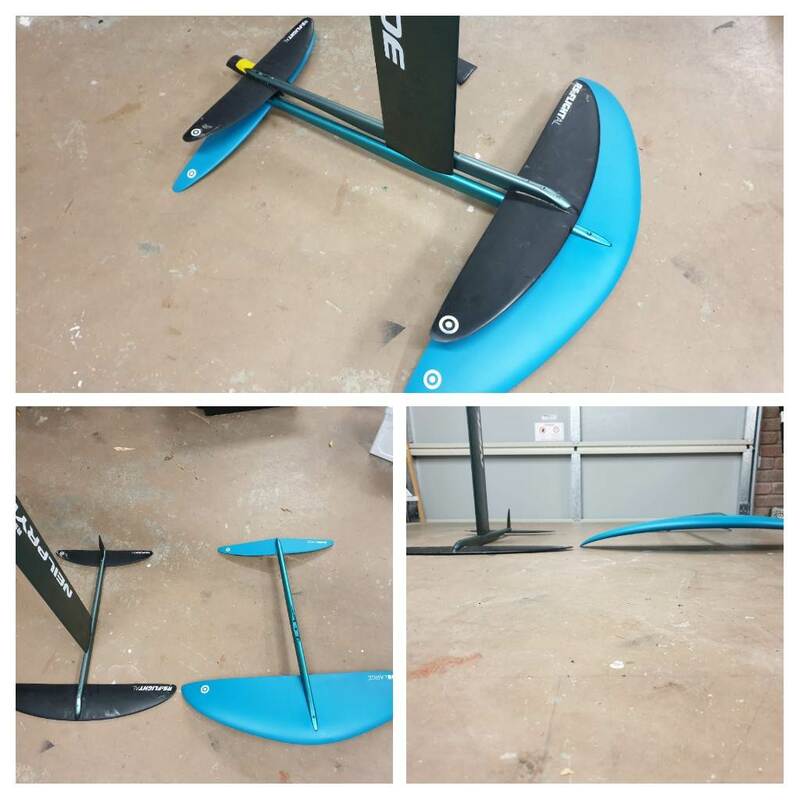 I just bought a NP Glide large from Reg at Windsurf Perth. haven't tried it yet, but hoping this weekend. For reference here's a photo compared to the 2018 NP Alu foil. I can't comment on Powerbox, I'm using my original tuttle mast (in pic). PS I'm +84kg using a 135 JP foilboard. i know someone who recently went from the NP AL pinkie foil to the NP Glide small and it has completely changed her view on foiling. She finds the Glide so much more stable and easy to use, that it's made her absolutely love foiling now. She uses it in a free ride board. Thanks to Maddlad, Snides8 and Cheryl for this info. She is going great in the conditions that I would like to foil. I guess it is still not proper to post a woman's weight without her permission! In the video I am using the NP Glide small wing with a 70 cm mast on a Tabou Rocket 135L board. I am 72kg . I usually use a sail about 1m2 less than what I would use on slalom kit. I can usually get foiling in about 12 knots without having to do any pumping. It's a really easy foil to use. This really helps me make the decision on the Wind Glide with the small wing. I am about the same weight as you, and I had the same frustration last year with the RS One Convertible as you did with the pinkie. Once the ice breaks up I will try it. I finally got my NP Glide Large out last weekend with around 15 knots of wind. Used a 5.5m sail, but probably should have had the 4.7 up. I realised when I got there that I'd left the harness at home and found that the arms tired fairly quickly, but the foil was much easier to sail than the 2018 AL foil. Smoother takeoff, more stable flight, although not having a harness made it more difficult to get comfortable, it also took me a while to realise that the boom had slippped down, so holding the boom in close was a bit awkward. Foot position was the biggest difference. Forward of the footstraps and back foot closer to centreline, more upright stance and feeling more in control with foot pressure rather than leveraging with footstraps at full tilt with the old foil. The footage is not great, I was in a bit of a rush. All things considered I'm looking forward to more time on this foil and concentrating on improving technique rather than gritting my teeth and hoping for the best with the old wing. Same location NP AL 2018 Foil. More wind smaller sail.